When I suggested to a work colleague that we try some of the great cheeses aged by Bernard Antony and his son Jean-Francois, he jumped at the idea. We both love good food and wine, and noticed that the father and son team propose a “Ceremony of Cheese” of three servings of various cheeses paired with wines, on location at their own cheese cellar in the booming village of Vieux-Ferrette, near Altkirch in southern Alsace. Little did we know that a special treat awaited. Jean-Francois suggested we try a unique ceremony. 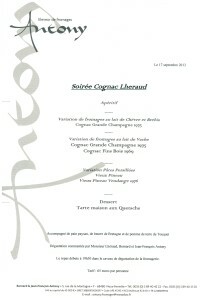 Not with wine, but with … Lheraud Cognac. Now, I do not think I will rush to pair my next Cognac with cheese (and vice-versa), but our experience proved truly extraordinary, in that we enjoyed some of the greatest vintage Cognac France can offer, with some of the best aged cheeses in the world. 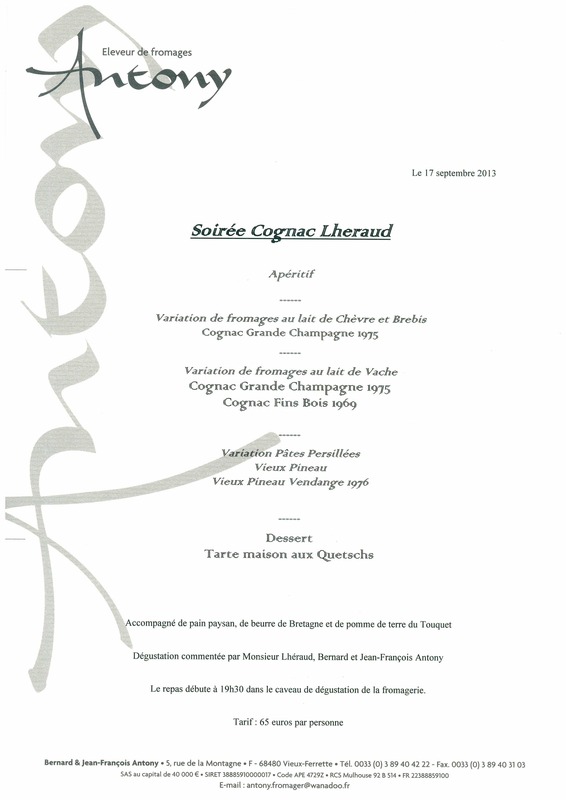 Click the menu below for a more detailed look (print error, as we enjoyed both 1973 and 1975 vintage Lheraud as well as 1969, an amazingly smooth vintage cognac). We started things off with a delicious white wine, Alsatian Auxerrois, a cool climate varietal which is related to Pinot Blanc. Exuding white fruit such as pear and apricot, its acidity proved an excellent match for the first set of goat and sheep cheeses, which included Rouelle, Tomme d’Elgine, Petit Fiancé, Charolais, Meule de Carayac and a fine Palet de l’Espinouse, whose aromas reminded me of a meadow in spring time, with dill like freshness. All of the above were harmonious and full of unique flavors, but the Perail de Brebis stuck out as particularly delicious and perhaps addictive. Creamy and smooth, revealing a pale yellow, soft and thick pate, it was nicely matched by the white wine. What made it stand out was its rather pronounced earthy aroma, somewhat like a horse stall – including the hay. I know, this may sound odd, but it was utterly pleasing. Let me be clear: the cheese did NOT smell of horse manure. Now, that would have been disgusting. Rather, its appealing “animal earthiness” on the nose, followed by a creamy texture and savory flavor on the palate, did wonders. I did not take detailed notes on the great cheeses, perhaps because they were so good that I spent more time marveling with fellow guests. As you can read from an article I had written a few years ago, Antony cheeses are special because of a constant search for balance and finesse, which is not always found in artisanal cheese made from raw milk. Bernard Antony started out in a modest épicerie before working under the tutelage of the legendary French cheese master Pierre Androuët, and since 1982 he has run his own cheese cellar in Vieux-Ferrette, near Altkirch in southern Alsace, where we enjoyed this magnificent “ceremony”. First recognized by the great French chef Alain Ducasse, who bought Antony’s cheeses for his restaurants, the father and son team prepare cheese for discerning connoisseurs around the world. At the celebrations for the 1994 opening of the Channel railway tunnel connecting France to the U.K., for example, Bernard was there to serve Queen Elizabeth II and former French President François Mitterrand. The Antony cheeses are served at scores of top restaurants, and he caters to some of the best châteaux in the Bordeaux wine country, where I first discovered the quality of his cheeses. Antony also regularly travels to major cities around the world, from Hong Kong and Singapore to New York and Chicago, offering eager cheese aficionados a taste of his edible oeuvres. 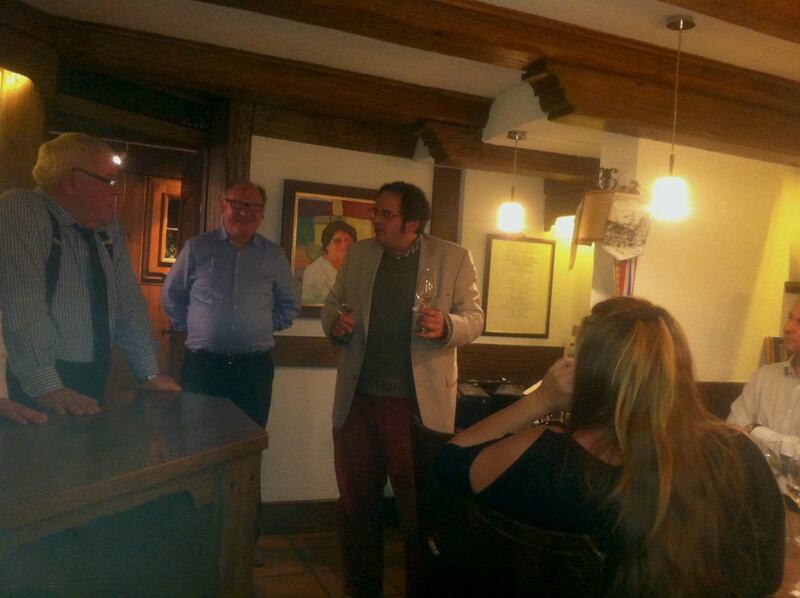 So it was a double treat that night to be introduced to one of the best Cognac producers in France: Lheraud. We were extremely lucky to drink rarer vintages – such as the Lheraud Grande Champagne 1969 and the Lheraud Petite Champagne 1973 and 1975, presented in a perfect reproductions of 18th century glass blown bottles. They had been aging for a very long time. For example, the 1969 was put in bottle just this year! All were amazingly smooth – and long, but the 1969 stole the show for me with particularly intense, deep and yet very subtle flavors. 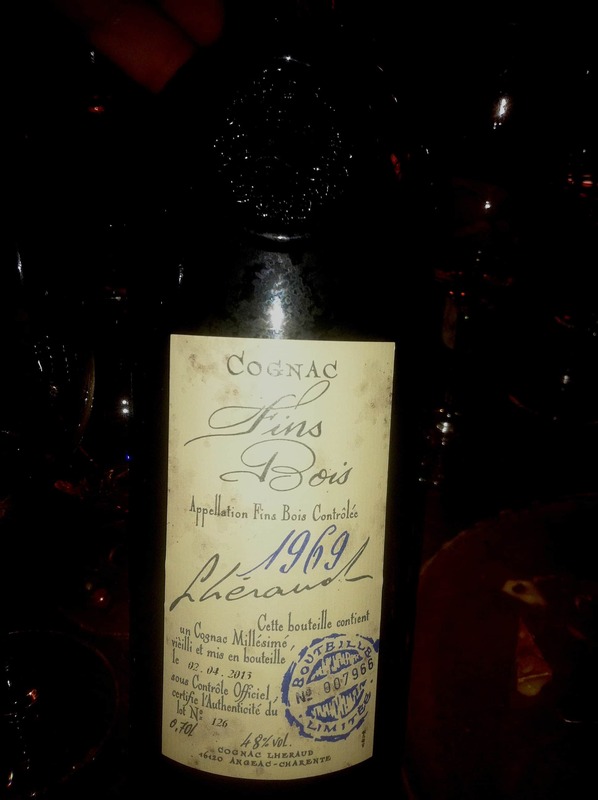 They all conveyed amazing complexity, varying from gunflint, spice and dried fruits – more prominent, for example, in the 1975 – to an even mellower expression of softer spice, vanilla, cardamon and crème brulée, in the sublime 1969 (photo, below). 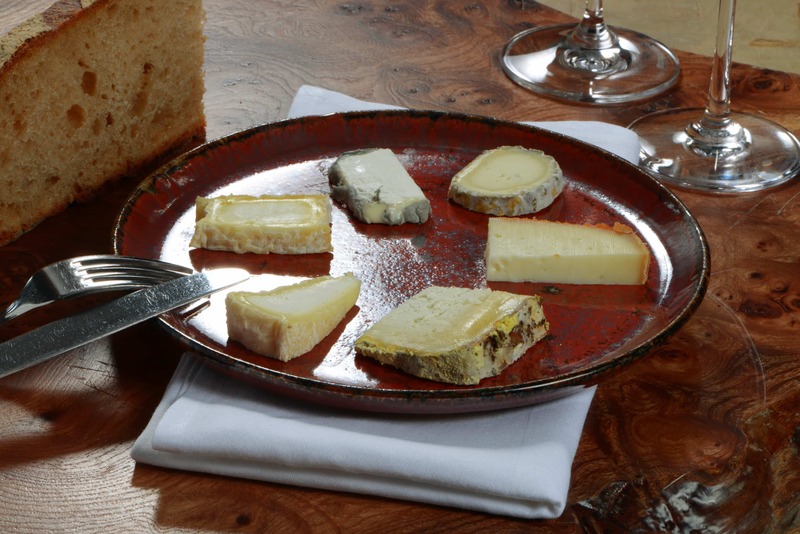 The more substantial mid-course cheeses – Citeaux, Revard, St Nectaire, Reblochon, Tomme de Chartreuse and Cantal – matched the power of the Cognacs, certainly because these superbly crafted Cognacs conveyed their power in subtle manners. Another wonderful addition to this enchanted evening were the Touquet potatoes – whose official inclusion in the French catalogue of spud types dates back to 1935, making it one of the oldest varieties still being produced today. Served with the skins, en robe de chambre, the potatoes’ unique nutty flavor and smooth and buttery texture, accentuated by Fleur de Sel sea salt, echoed the somewhat nutty aspects of the Cognacs. Along with Cognac, Lheraud crafts excellent old Pineau des Charentes – a fortified wine (mistelle or vin de liqueur), made from a blend of grape must (non fermented, in the case of Lheraud) and Cognac eau-de-vie. 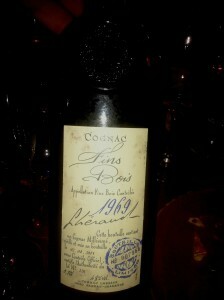 We enjoyed a particularly delicious vintage from 1976. Exceptionally fresh and lively, the Lheraud Pineau des Charentes exuded candied fruits and nut like flavors, and went very well with the last cheeses: Fourme d’Ambert, Stichelton and Fourme fermière. I particularly liked the Stichelton, an English blue cheese similar to Blue Stilton, except that it does not use pasteurised milk. For 65 euros, the evening was a steal. Considering the exceptional quality of Antony cheeses and that some of these Cognacs go for as much as 500 euros per bottle. But what made the evening so special were simply good spirits, all around.